On the 17th of August SUWO launched into its semester 2 program with an exciting and intimate concert at the Stanmore Baptist Church. A huge thank you must be extended to all of our supporters who attended. With your help we raised more than $500! SUWO Presents Showcase! was an excellent opportunity for members to step out of the band environment and shine as solo performers or in chamber ensembles. All sections of the band were well represented with a diverse repertoire of music performed. The night opened with an appropriate performance for the church venue when the trumpet quartet played Fransciso Guerreo’s sacred motet “O Virgo Benedicta”. Next up was the 8 piece clarinet choir which wowed the audience with two exciting pieces: “Folk Song Suite” and “Tico Tico”. It was especially exciting to see and hear some instruments from the clarinet family not often represented. After the clarinet choir came the flute choir, with a moving arrangement of “Nimrod” from Edward Elgar’s Enigma Variations. We were then treated to a special composition by one of our own members. Claudia Nagy on Alto saxophone and Stuart Rynn on piano amazed the audience with Daniel Dinh’s “Breviloquence.” Next up- More Clarinets! Daniel Dinh and Jonathan Feldman presented three duets on rare crystal clarinets. If the exceptional performances of these songs weren’t enough to keep the audience engaged (which they were!) then these truly unique clarinets were sure to catch everyone’s attention. Mighty percussion rounded out the first part of the concert with performances from Stuart Rynn and James Guest. First Stuart amazed the audience with an incredible rendition of “Adagio and Allegro for Timpani”. No one had any trouble believing they were listening to a performance by the Australian Open Percussion Champion! Similarly no one could fault the enthralling performance of “Rotation IV” on Marimba by the NSW State Champion Mallet Keyboard percussionist James. The audience was left wondering how our incredible percussionists could best these performances. All questions were answered when Stuart, the state runner up Keyboard Mallet Percussionist joined James at the Marimba. 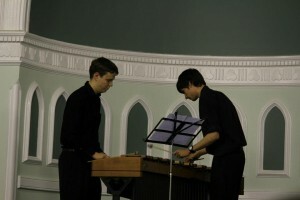 Everyone was left breathless as the two virtuosic performers stood on opposite sides of the same Marimba and gave an exhilarating performance of Steve Reich’s “Nagoya Marimbas”. Now that the individual sections had been given their chance to shine, the flourishing woodwinds, bold brass and mighty percussion came together to present SUWO’s state band championships program. The band opened with its sacred item “Salvation is Created” composed by Tschesnokoff and arranged by Houseknecht. This beautiful hymn sounded right at home in the church. Next came the test piece “Four Dances From West Side Story”. Everyone had fun listening to Ian Polster’s arrangement of music from the Leonard Bernstein classic. The evening was rounded out with a rousing performance of Alfred Reed’s “Armenian Dances”. The audience was taken on a journey through Armenia experiencing a series of traditional dances in a fitting finale for a great concert. Once again, thank you to everyone who came along and donated. Your support is greatly appreciated.